Millersville dropped its fifth straight game on a wet and windy Saturday evening. They lost to the Kutztown Golden Bears by a score of 47-14. The Marauders are now 0-5 this season. Over the last few games, Millersville has struggled offensively to get points on the board. Freshman Phil Overton scored Millersville’s two touchdowns in the second half. His first touchdown came from a six-yard pass from Marauder quarterback JJ Paige. His second touchdown was a one-yard run that ended a seven-play drive late in the fourth quarter. Phil Overton found the endzone twice against KU. Overton’s first touchdown came from an opportunity that was seized. Millersville began that drive on the Kutztown 25-yard line. The good field positioning for Millersville’s offense resulted from a bad snap made during Kutztown’s punt attempt. Millersville apprehended another opportunity when junior cornerback Alpha Khan made his first career interception. Millersville’s second scoring drive began at the 49-yard line. Overton’s one-yard touchdown was set up by JJ Paige’s 22-yard page pass to Kevin Wiggins. On that drive, Paige managed to complete three passes with two rushing plays. He then went on to say that the team wants to continue to work on seizing opportunities that could result in points. The Millersville offense totaled 245 yards. JJ Paige managed to finish 14 for 21 with 141 passing yards. 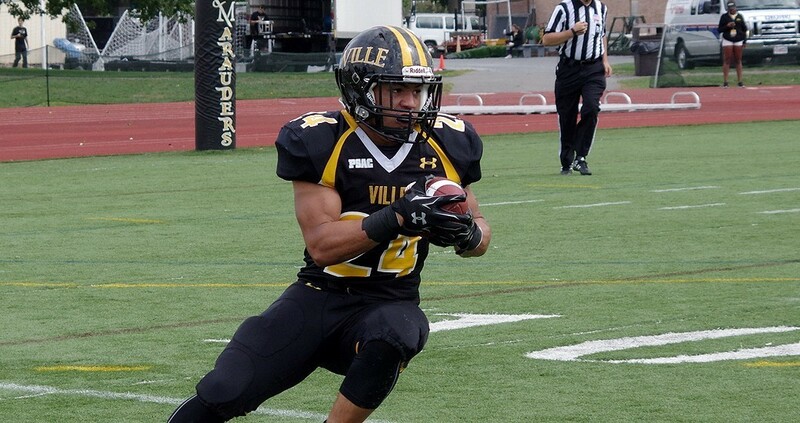 Cimirrow Moat’s 49 rushing yards led Millersville’s ground attack. Breitbach praises his quarterback for making good decisions, especially in the second half. He applauds him for getting the ball out of his hands quickly. Breitbach stated that the difference in that game was at the line of scrimmage. He then mentioned that the Kutztown defense dominated the Marauder offense up front. “Football is a line of scrimmage game where you have to be good fundamentally and be strong at the line of scrimmage,” Breitbach said. You have to make blocks on offense and get off blocks on defense. They did that much better than we did in the first half. After making adjustments at halftime, he felt that the game was a lot closer due to his offensive and defensive lines playing better in the second half. Going into the game on Saturday, Kutztown quarterback Chad Barton was the PSAC leader in three passing categories. He managed to complete 7 out of 19 passes for 98 yards. Their establishment of the running game and their ability to execute it didn’t require Barton to pass very much. The Golden Bears totaled 400 rushing yards with 322 of them coming from the first half. Their rushing attack managed to give the Golden Bears a 34-0 halftime lead. Terry Williams scored three of Kutztown’s touchdowns. All three of his scores were rushing touchdowns that came in the first half. “We weren’t able to stop their run to the level that we needed to,” Breitbach commented on defending against Kutztown’s running game. Other rushing touchdowns for Kutztown came from Darrell Scott and James Wah Jr. Scott ran for 9 yards in the second quarter. Wah then ran 62 yards in the fourth quarter to score Kutztown’s final touchdown. Kodi Reed’s two touchdowns came from the air. His first one was a 7-yard pass that came in the second quarter. He then caught a 33-yard pass in the fourth quarter for his second touchdown; Barton threw both passes. Breitbach went on the mention that the weather conditions dictated to both teams that passing the ball was going to be difficult. However, whenever Kutztown did throw the ball, he stated that at the defensive back level, they were able to get the job done. The Marauder defense managed to make some plays in the end zone and batted balls away on third down. The Marauders return home on Saturday to face the Bloomsburg Huskies at 4 p.m. The Huskies have a physical run first offense with nine returning starters. Breitbach stated that the team needs improvement on their run defense. He also believes that this game will help them in their preparation to face Bloomsburg, another run-heavy team. “It will definitely be a tool for where we have to improve,” he said. Breitbach stated that he and his team have got to focus on not giving up big plays but to continue to play as a unit. But ultimately, they are more worried about the direction of the team and its success is going.